When you hear the word “startup” you probably think of Silicon Valley in California. 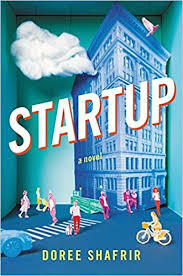 However, New York City has a budding startup culture of its own, and this vibrant city is the backdrop for Startup, the debut novel by Buzzfeed and Rolling Stone editor Doree Shafrir. The story follows the lives of four characters who are submerged in a youth-dominated, risk-taking, high stakes startup world where techies furiously scramble to create the next multi-million dollar app. Early 20-something Katya is a tech reporter looking for a big story, prodded at every turn by her 40-something year old boss, Dan. Dan’s wife Sabrina works for tech wonderkid Mack McAllister, whom Dan abhors. Their lives are forever altered by a string of bad decisions that may jeopardize Mack’s career and Dan and Sabrina’s marriage. A page-turning view of the tech industry, warts and all.